Toying around with a leveling system.....still in the design stage, but closing in on it. Interesting. I've seen aftermarket hacks with this feature, but I gotta ask: why on a Ural? It's a Ural frame alright , but will be hung on that GS you see in the background in the vid.....Not that I wouldn't do this to my Ural if I was keeping it, I've seen theses mods in action and they do come in handy sometimes. 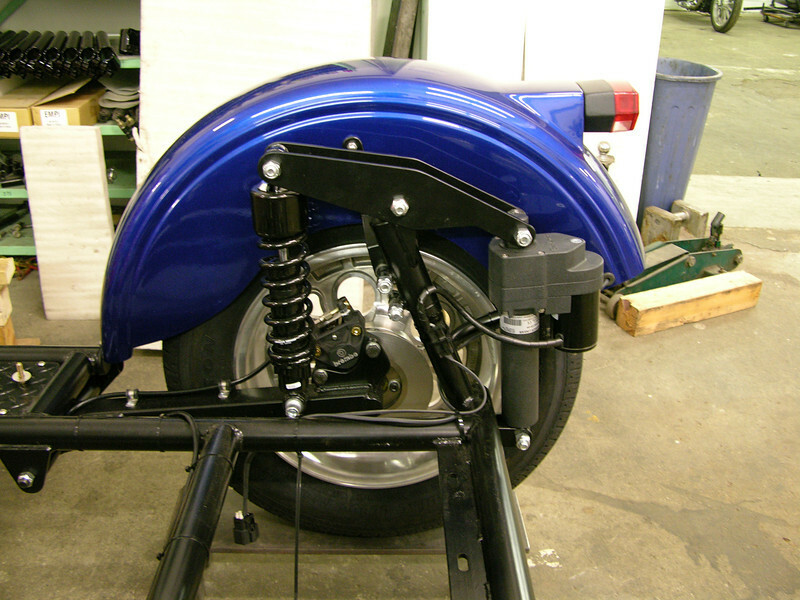 Is this to increase ride height for off-road situations and lower it for pavement stability? That's one thing one could do with this feature. I was looking at keeping the rig level as possible when riding back roads that have a bit of an angle to them.....and to compensate for heavy loads. I see. Will the juice be worth the squeeze? and to compensate for heavy loads. Seems to me like only a stiffer rate spring on the shock could properly do that, but I might be off-base. I've done some roads where I sure wish I could have raised or lowered the tub a bit to feel a bit more "comfortable" riding them....mostly when the tub seems to be higher than you are As to the stiffer spring rate shock.....one is not always toting a heavy load. Chuck, just curious, would it be possible to make a 2WD version of this? Also, do you make any mods to bolster the axle for the change in angle(s)? Looks great - thank you for sharing! Matt.....you would have to do some frame mods to make a 2wd version......the frame would be in the way when you tried to raise the sidecar up higher.....the drive shaft would hit the frame.....you might be able to lower the rig....looking at my GU, the driveshaft might fit up in the well that runs cross ways in the tub. I didn't have to do anything to the axle.....but to be clear, are you talking axle or drive shaft? I can take some close up still shots if you like. Matt, on the rig I'm working on there will be no two wheel drive, so no drive shaft.....but I'm sure with some design work one could make this system work with a 2wd rig. Is this something you would like to do to your rig? Right you are.....but it's making me think about doing a bit of design work to see if one could pull it off without too much trouble. I'm thinking the splines in the drive shaft might have to be extended a bit to make it happen. I guess it depends on how far you raise and lower the sidecar wheel. Nice. DMC offers a similar set up on their rigs.